Certified to AS/NZS4601 amendment 1 2003 and AS/NZS3749.1 2003 Class B. The MAP80S is the very common model in the Mongoose range and is controlled from your cars existing factory remote control and 'upgrades' the vehicles original central locking to a full security system. This model is very comprehensive and is equipped with TWO automatic engine immobilisers, full alarm functions, 2 stage impact sensor, black wiring, battery back-up siren with soft arm and disarm chirp, safety ignition door locking, automatic re-arm and automatic re-lock, turbo timer interface software to name but a few. 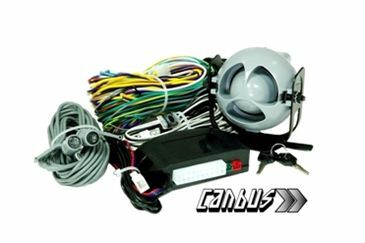 If your vehicle already has remote controlled central locking, then consider the MAP80S - it was specifically designed for your vehicle. 2 circuit engine immobilisation • Boot, bonnet, door protection • Back up battery siren • 2 stage shock sensor • Turbo timer interface • Door open audible warning • All black wiring • False alarm nuisance prevention • 4 digit pin override • Blue L.E.D • Variety of other sensors available (optional). Many vehicle manufacturers are now using computer digital communication (canbus) to control your vehicles functions. This allows for a vast reduction in the amount of copper cabling as it is like your internet connection, a single wire can handle a multitude of tasks. Anything from opening a door to the running of the engine - it's all monitored and controlled by the cars computer. Because of this, conventional analogue security alarm systems are either impossible or very difficult to fit, mainly because there are no wires to connect too! The MAP70G Works seamlessly with Factory supplied OEM remotes, once the vehicle specific firmware is downloaded into it.